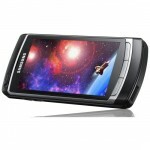 Samsung i8910 is also known as the Samsung Omnia HD. It is a multimedia smartphone by Samsung, released on February 18, 2009.This handset comes with a 3.7″ OLED capacitive touchscreen that has a resolution of 640 x 360 pixels, capable of displaying up to 16 million colors. It has an 8 megapixel camera with LED flash and the industry’s first 720p HD video recording at 24 fps and other imaging features which include geotagging, face detection, smile detection and WDR,that is, Wide Dynamic Range setting. The contrast and colors present in this phone are really impressive making every image look really vibrant. 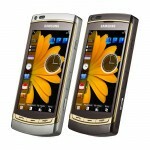 The i8910 Omnia HD runs on Symbian S60 5th edition operating system with Samsung’s TouchWiz interface. The TouchWiz interface on the homescreen, allows the consumer to configure up to four different screens with widgets. The device offers a Wi-Fi with DLNA, Bluetooth 2.0 with A2DP, a standard micro USB port, a 3.5mm audio jack and TV-out. A GPS receiver with A-GPS is included, which has an optional Samsung Mobile Navigator by Route 66.The Omnia HD comes in two versions: with 8 or 16GB of integrated storage, that is, internal memory both having a hot-swappable microSD card slot handling up to 32GB as external memory. it has 1500 mAh battery which is a good one. The i8910 HD is a quad-band GSM/GPRS/EDGE handset with tri-band UMTS support, HSDPA which is up to 7.2 Mbps and HSUPA which ranges up to 5.76 Mbps support. The Australian release of the Samsung Omnia supports the UMTS 2100/900Mhz frequency band, making it dual band UMTS and operational on Optus’ ‘yes G’dual band network but not on Telstra’s ‘Next G’ network, s that operates on the UMTS 850Mhz band only. In this instance the GSM network would be used. The lightest touch will do for a command to be registered – no pressure is necessary. The capacitive technology used for the display guarantees an excellent responsiveness of the screen The Samsung i8910 Omnia HD has the standard looks with a metallic frame around the display and the battery cover is entirely metallic but the glossy plastic around the display looks rather cheap. The Samsung i8910 Omnia HD lacks the contacts bar. The music player is quite a decent one having a good set of features and a large number of supported formats, which means there is no need for converting of your favorite tracks. 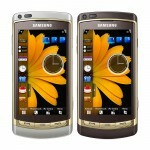 Our reviews on the Samsung Omnia HD is that the general build quality of Samsung i8910 Omnia HD is a mixed bag. The metal battery cover and the huge OLED display are true high end materials but the plastic bits are below par.